When new members join us, we try our hardest to get to know them and contact them, but it's getting harder to do as more join. I cannot stress enough that you should contact us and connect with us on Facebook if you use it. We can then add you to the "secret" publicity setting group and participate on the goings on there and get invited to the facebook events like the one for Machen Bachen. Facebook will never be a substitute for our posts on this website, but if you use Facebook, you'll want to join us there. When Captain Leo approached us about writing a story involving all the Order, we were flattered. The story led him to an event that anyone whose read the Masquerade is familiar with, the killing of a Technocrat leader and the fallout that proceeds that event. This put us in the situation of having to react to it. The story couldn't live in a vacuum. The technocrats would become the stern somewhat oppressive jerks we've always envisioned they would become. Funny aside, I really think that the government system works even though it's run by psychopaths and Phin just thinks they're evil, period. Neither opinion is "correct" since we're both Order members. We are amused that real politics came forth from the fiction. However, these guys are not good people. They do bad things. As I allude to in my story The Phantom of the Black Leaf and Earl, they experiment on Vibranni and poor folk under the guise of Argenstrath Medical Research. They also attempt to control any and all water production and selling, water is life, life is power - so it says on the flag. We'd like you to continue to describe ways in which in the police and government oppresses you at least subtly. We're sure after one story from any of us that they can cool it on the random ship searches and such, but you'll at least see Lucas travel abroad waiting for the heat to die down. This brings us to our next topic nicely, major events like the murder of Charles Button. We'd like to do more of them in future, just please run it by the Order before any major story events that would effect us all. Perhaps we'll do them once a year, who knows. We like the idea of events that tie our stories together. Our world is best enriched and made real when we use things and places that others have also used. It gives us and our readers a sense of place and culture. So the more people can collude and collaborate on shops and towns and creatures, etc. the better. This is one of the major reasons for the encyclopedia, but also you'll be sure if you create an interesting shop or vendor etc, I'll try to work it into a story of mine and I hope that you'll try to work in places and things from other's stories as well. We hope to go to farther and bigger events next year such as World's Fair in New Jersey and Teslacon in Wisconson. 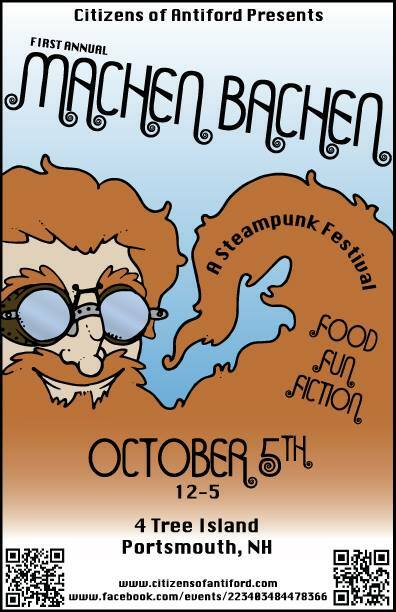 This brings us to our first big event hosted by the Citizens of Antiford, Machen Bachen. It's going to be big, it's going to be fun. It's the talk of the town and we're attracting far more than we first thought we would and it's growing as the event nears.